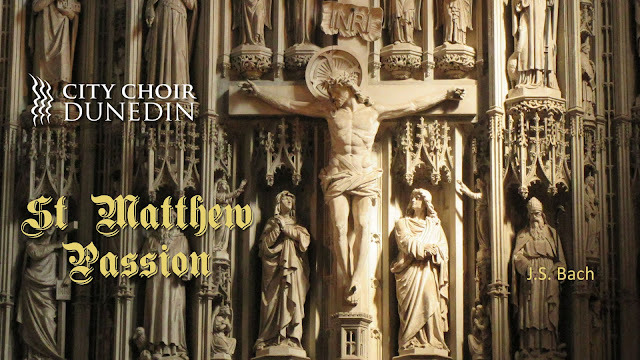 St Matthew Passion, by JS Bach, is a deeply moving oratorio requiring dramatic performances from all. Yesterday's performance in Dunedin Town Hall, conducted by David Burchell, showcased the choral majesty of Bach's music in a marathon of energy and passion. This is not an easy work, demanding almost three hours' interpretation of emotional musical intensity, expressed in German, a foreign language to most of the performers. The text outlines Christ's final days from various perspectives, with a narrator (Evangelist - Iain Tetley), Jesus (Scott Bezett) and other principal soloists - Lois Johnston (soprano), Claire Barton (contralto), Andrew Grenon (tenor) and Malcolm Leitch (bass) taking on different roles and characters to advance the storyline between full choral anthems from combined choirs - City Choir Dunedin, Christchurch City Choir, and Forte (Fairfield School) who added an extra timbre to harmonic textures of the big anthems in Part 1. Dunedin Symphony Orchestra provided a 30-piece baroque orchestra, including three keyboard continuo performers, two oboes d'amore adding impressive gilding to some of the vocal solos, and a viola da gamba. The overall performance was a credit to all participating. However, with the 160-voice choir, musical articulation and clarity of German was sometimes needy, but their balance, intonation, quality of tone and expression was excellent. Tetley possesses a crisp clear tenor, with counter-tenor colouring, which is ideal for ``story-telling''. Bezett, at age 21, was outstanding in his interpretation of the role of Jesus. His voice carried well, reflecting sound technique and hours of preparation. Johnston and Barton often sing together, and the fine balance for their duet was a highlight. Enthusiastic prolonged applause and endless comments of approval rewarded the performance. A big thank-you to City Choir Dunedin, the six soloists and the Dunedin Symphony Orchestra, and of course the conductor David Burchell for the magnificent performance of the St Matthew Passion. The dramatic music stirred the emotions, and I had tears in my eyes when the evangelist raises his voice when he imitates the crowing of the rooster. But this is not an opera but church music which can inspire the listener to deep contemplation. So, please audience, do not applaud at the end of the performance. Bouquets of flowers to the conductor and soloists seem out of place, as this is not a concert. I write to express deep appreciation of the performance of Bach's St Matthew Passion at Dunedin Town Hall on Sunday, 31 March. Grateful thanks are due to the combined choirs, the orchestra and soloists for heartfelt and disciplined music making. That five cathedral organists were present says much for the respect we all give to David Burchell, conductor, Tessa Petersen, concertmaster, and all involved. The outstanding playing of Polly Sussex, viola da gamba, carried throughout the magnificent town hall and added authenticity. Bach gives us much to contemplate in this Passiontide season, as for example when his music adorns the text: "As long as life lasts, we have a thousand thanks for Christ's sufferings, for having valued so highly the salvation of our souls." And out of suffering will soon come the joy and miracle of Easter Day!